April 14th ,PASSION (or PALM) SUNDAY, there will be a joint service with the Czech and Spanish communities beginning at Infant Jesus of Prague Church- Karmelitska street- at 11:00 am. April 17th Spy Wednesday, in Holy Week, Confessions and Mass at 18:00/06:00 pm in Saint Barbara’s Chapel. April 18th , HOLY THURSDAY. At 9:30am Mass with the Cardinal in the Cathedral of St. Vitus. At 06:30/18:30 Mass of the Lord’s Supper with the Washing of Feet, the Transfer of the Sacrament. At 09:00/21:00 Adoration. 18:00/06:00 – Mass for Families and Children. 11:30pm/23:30- Christmas carols sung in Czech and English followed by the traditional Midnight Mass. Join us in the weekend celebrations of spiritual events. There will be Holy Masses, Candlelight Processions, Prayers and Reflection, Concerts, Video Showing and more. September 8th – Holy Mass celebrating Blessed Virgin Mary’s Nativity (CZ, EN, ES) at 18:00/6:00pm followed by a candlelight procession along Mala Strana. The 21st Annual Marian Pilgrimage to the Shrine of the Gracious Madonna, at sv. Dobrotiva-Zaječov, will be held on May 12. We meet at Ujezd street –near of Legii bridge , at 08:30 am, Saturday morning, May 12. If you do not have a ride please contact Fr. Juan Bautista for details. In keeping with our tradition, please bring a lunch, which you can share with another person on pilgrimage. Whatever is left over (if you so will) is given to the poor. St. Thomas Parish is organizing a trip to the Holy Land. It will take place from Monday April 30th to Wednesday May 9th. The itinerary includes visits to all the important biblical sites in the following areas: Jaffa, Galilee, Nazareth, Tiberias, Holy Mountain, Capharnaum, Judea, Jericho, Bethlehem, Ein Karem, Qumran, Jerusalem, Mount Zion, Gethsemane and Bethania. Sunday December 17th we will have a join Mass with the Czech and Spanish community at 11:00am. After Mass the Spanish community invites us for the advent tradition of “Pastorela”. Then will be a join lunch and in the afternoon several a activities for children and adult. You are invited. Come to celebrate with us! Its Back to School time! As you know, the St. Tomas Religious Education Program takes a special interest in kids in need in our community. We are now holding our third School Supplies Drive to collect much-needed school supplies for the children of our parish school, those in foster care or orphanages, and in shelters or safehouses in Prague. 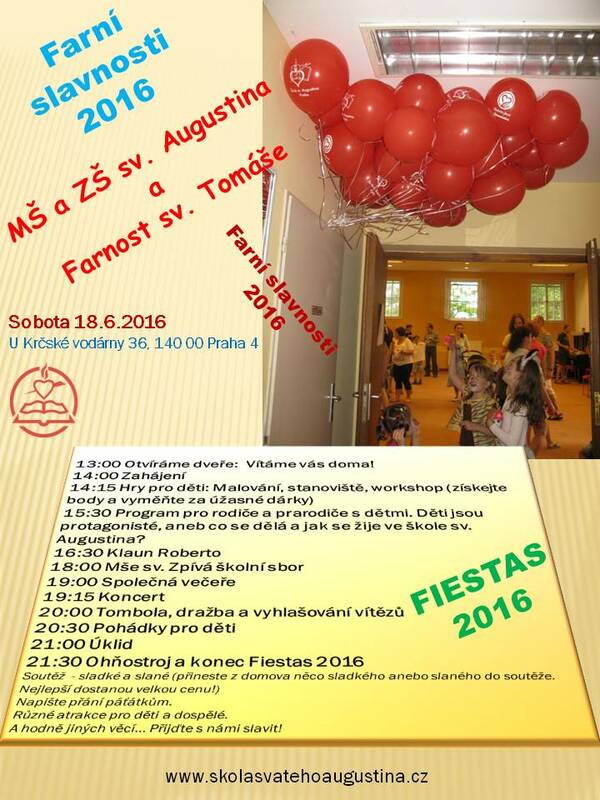 The 14th PARISH FESTIVAL. June 3rd 2017. (Usedlost Ladronka, Tomanová 1, Prague 6). Program for children and for adult. Lunch will be a picnic. Please bring something to share!